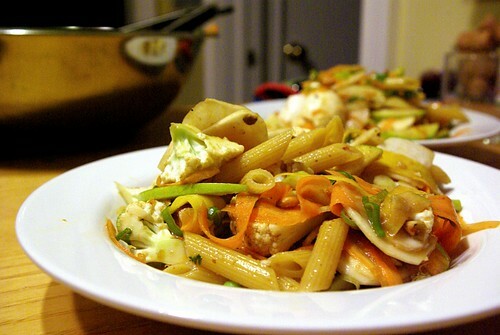 summer pasta salad with fresh vegetables and light miso dressing, originally uploaded by aarn! +20th July, 2009+. mixed together 1.5T. spicy brown mustard, 2T. soy sauce, 1T. sherry vinegar, 1T. white miso paste, a pinch of garlic powder, dried onion, salt and pepper. poured the dressing over shaved yellow and orange carrots, finely chopped green onion, thin slices of asian turnips, sweet peas, chunks of raw cauliflower, slices of granny smith apple, and 1/2lb. of penne pasta, cooked al dente and rinsed in cold water and drained well.